I've never been able to answer before but now I can. Done, I was waiting for this to happen for the last two years. A few quirks, but hey, it is a huge thing for us, mashup developers in Argentina. the future perhaps when the sea rises??? Congratulations! We were expecting this from a long time ago! Now, go ahead and add directions, places and shops, traffic state and maybe, in the future, street view. Please visit Basta de Demoler and check all the architectural heritage in danger in Buenos Aires. I am trying to add our business to Google Maps in Argentina but when you go the the Google Local section to add a business it doesn´t give you the option of adding a company to Argentina. However, when you look at Google Maps quite a few of our competitors are listed? 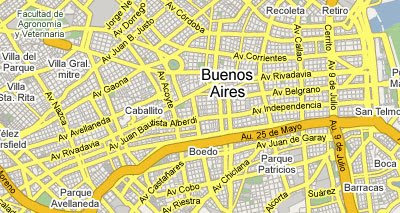 Does anyone have any idea how to add a company listing to Google Maps in Argentina? @ Anonymous - try the Understanding Google Maps & Yahoo Local Search blog.